Cincopa Lead Generator is a great marketing tool that works with video galleries and allows you to generate leads directly from your videos. A pop-up email form shows up right where you want to display it in a video playlist or in a single video. You can place it after the first or the last video in a playlist, after all videos, after 25%, 50% or 75%. The email collector does all the routine work for you. Every lead is saved directly to a specified email list (it’s required to connect your account with an external email marketing service). You can easily set up an email provider, for example, MailChimp or Constant Contact, in the Lead Generator settings. You can find detailed stats about your email leads in Cincopa Video Analytics. Select a specific video you want to analyze and you’ll see the live feed of video viewers including those who shared their email address and name with you. On a user screen, you can find more information about them, including their location, IP address, web browser version, first and last activity dates, the total number of video views, and average engagement. Choose the video gallery where you would like to collect leads from and click to edit it. Expand the ‘Lead Generator’ tab and toggle the email form activation button to ‘ON’. Select the email form type. You can use Cincopa’s default form, a custom HTML form, or a form retrieved from an external URL. You can customize the form’s name, form message, choose which form fields you want to display, and set form timing (where exactly it will show up in your video). Allow users to skip the form or make it non-skippable by selecting the checkbox. Click to set up an email provider. 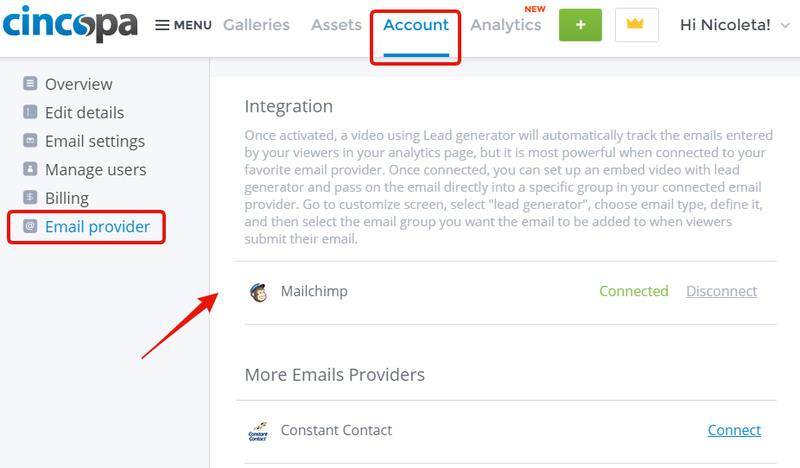 After authorization with your account, leads will be automatically added to the email list that you can select from the drop-down menu.